If I’d paid more attention in my first zoology course at Shasta Junior College, this wouldn’t have come as such a shocker to me. Ever since I was kid, I called certain cute little bugs ‘roly-polies’ – since they roll up when threatened. Today it finally hit me that my trip to the Children’s Science Center in St. Louis last year scarred my psyche beyond repair (unless the marijuana initiative passes in Arizona today – you know what I mean) based on the actual truth about pill bugs. I just buried it in denial until now. 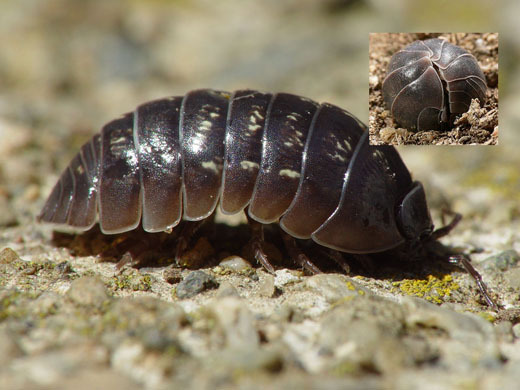 What I found out, and what just exploded into my conscious mind today while mowing the lawn, is that pill bugs, roly-polies, roll-up bugs, whatever you call them, are actually – DEEP BREATH! – Crustaceans!!! The best-known crustaceans are probably crabs, lobsters, crayfish, shrimp, krill, woodlice and barnacles. Some of them, like pill bugs (i.e., isopods), have seven pairs of legs. That’s the scientific name of the pill bug. Don’t you just love the creativity of zoologists when it comes to naming things? How many Aggies does it take to eat an armadillo? Two. One to do the eating, and one to watch for cars. I feel like I got something important off my chest here. The stress of it all makes me want to take a nap now.